T his is the story of an aspiring agent’s mission to escape the State of Mediocrity and reach Service City, the Capital of Prosperity. There will be many challenges ahead, but if successful the aspiring agent will become a top operative within the Secret Service. An Agency that is essential to the success of the whole of Prosperity and to its valued Founder, known as Customer. According to the State of Mediocrity’s definition of success, aspiring agent Smith is a good example. After earning an average degree at University, he got an average job with an average company. How to align personal and professional success. How to move from being unaware to aware. How to ignore complacency and fixed-thinking. How to assess your motives and recognise the motives of others. How to harness the three parts of your Self-Concept. How to gain insight into the behaviour of others. How to use the three-of-you rule to confirm how you truly feel about something. How to understand and apply the prime directive in relationships. How to develop the best feeling in the world. How to benefit from facing adversity. How to reveal your greatest treasure. How to confront your greatest fear. How to learn through your mistakes. How to learn to forgive yourself. How to keep your mind on what is important to you. How to inspire yourself with what you stand for. How to recognise the habits that distract you from your path. How to avoid quick-fix and trivia. How to avoid arrogance and pride. How to avoid hostility and spite. How to meet with disappointment. How to be in command over your actions. How to keep control over your emotions. How to filter out negative voices. How to address our two ultimate choices. How to know when you are on the right road. How to follow through what you start. How to become the person you are destined to be. The key leadership attributes and team-building skills critical to success. The 7 vital questions to build customer loyalty. How to encourage everyone to think customer. Why customers don’t value your service. How to turn one-time buyers into lifetime customers. The 12-point road map for delivering business success. The 21 secrets to winning and keeping customers. 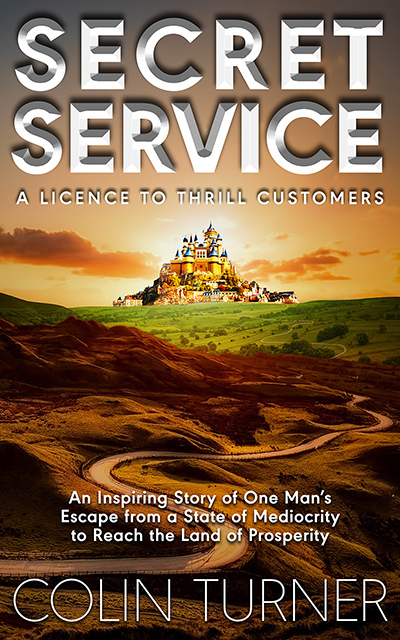 How to harness The Law of Service. How to increase reward with The Law of Secret Service. Why marketing initiatives are misguided. How to develop a proven Strategy for better-than-excellent customer service.